Regional states should not pin their hopes on the US support because “the US is the same country that had no option but to leave Syria after years of efforts to create violence and chaos in the country,” General Baqeri said. He made the remarks during his Monday visit to the southern Island of Abu Musa, which was aimed at closely watching the military capabilities of the Iranian army units deployed in the island. “Some Persian Gulf states call on the US to come to the region and sow seeds of discord among regional states,” he said. However, he added, the Islamic Republic of Iran has a strong and decisive military presence in the region to defend its sovereignty in case of emergency and it holds Persian Gulf states responsible for any consequences. The Iranian commander warned some regional enemies of the Islamic Republic against hatching plots against Iran and said the foes should know that although Iran has adopted a peacekeeping doctrine, it has a strong military presence in the region. 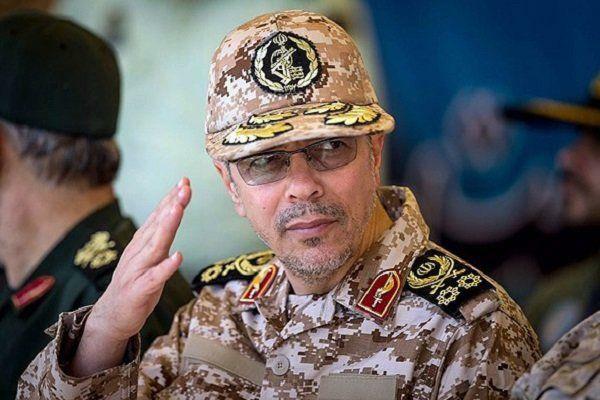 General Baqeri described the high level of security in the Hormoz Strait and the Persian Gulf as exemplary, saying such security could not be created without the sacrifices made by strong forces of Iran, their military capabilities and cutting-edge military equipment. The Iranian commander then recalled Iran’s peacekeeping measures throughout history and added that the Islamic Republic has always been the pioneer of peace and friendship. “Even our drills have been conducted with the same theme,” he added. The commander concluded that protecting regional security is possible only through establishing multi-lateral cooperation among regional states, adding that foreign presence hampers regional states’ goal to bring about stability.